A discussion about Best Practices will bring up the question: “Where did those best practices come from and how were they developed?”. 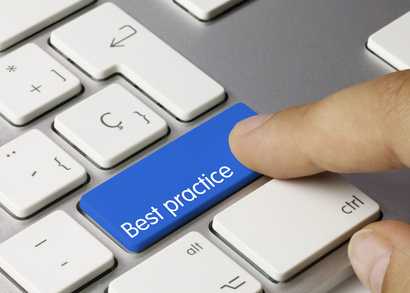 My major problem with “Best Practices” is that they often are actually “Most Common” practices but not necessarily the Best or not the Best for your company, department, goal or project. Already early in my career I was confronted very frequently, after thoroughly preparing a project including an action plan, budget and suggested timing, with the question “What does the competition do?”. Surely a very demotivating question for a young ambitious manager and it took a while to see the validity of the question and the wisdom of keeping an eye on the competition. Keeping an eye on the competition, or using surveys to find prevailing practices in the industry can be a very useful tool to ensure you know what you are up against. When the competition is in the same economic turmoil as your company and not more successful the question also needs to be asked if it is wise to follow that competition or rather to learn what they do and then avoid that path as it apparently does not work well. Most surveys present averages or summaries of the actual information. You will need to understand the details, background of the participants, circumstances in the industry and the spread or distribution of the entries to have a successful tool to guide you. Best practices, when they actually represent most common practices, can be a sign of intellectual laziness. You may fail to explore the actual unique best practice for your situation. Here is a quote from W. Carroll (Bill) Munro, marketing director, PepsiCo “Imitation is the sincerest form of collective stupidity.” . By definition surveys will bring you old news; salaries paid last year, benefits offered last year, etc. or plans that are uncertain will ever actually materialize, like salary increase prognosis for next year or planned capacity expansion. You will need to have a view on real time live data in order to know your competition’s moves and then question it, evaluate it, adapt it and when you are satisfied, go and seek support at the appropriate levels to adopt it. Failure to adapt. What works in one company will not likely work in yours unless the practice is customized for your culture, environment, and people. Tailor any lesson from others to fit your unique situation. Failure to adopt. A borrowed process or tool won’t work unless you have commitment from leadership and those responsible for using it. Be sure you have full support before you implement. We like to hear from you. Drop us an email (stories@10pointsmanagement.com) about your story with Best Practices.